It may take a village to raise a child, or a team to win a championship . . . but it takes a group of organized "Snow Warriors" to get commuters to work on time during the wintry months in Columbus, Ohio. Managing the complexities of new GIS software, three consultants, more than 100 snow operation vehicles, and a street network of approximately 2,000 miles is a daunting task. The City of Columbus Department of Public Services (DPS) has found a way to provide a management formula that creates, tests, and implements this task. The unpredictable nature of snow and ice events makes it difficult to track costs, measure resources, and monitor where and how these resources are distributed throughout the city during an event. Like most public service departments, Columbus DPS staff manages transportation infrastructure and all the operations and maintenance that go with it, including snow and ice. To be prepared for this year's snow season, the DPS Snow Warriors are using a new GIS web application they named "Warrior Watch," which utilizes the Esri ArcGIS GeoEvent Processor for Server. This new GIS technology will internally monitor both real-time and historical performance of the city's snow and ice removal activities. 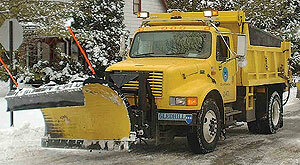 A City of Columbus snowplow. DPS staff worked closely with the city's Department of Technology (DoT) GIS staff to help manage the behind-the-scenes architecture necessary for deployment of the plan. Successful deployment also consisted of a team of consultants that included T&M Associates (Columbus, Ohio), Esri Silver Tier partner Network Fleet (San Diego, California), and Esri. DPS had to devise a system that efficiently and seamlessly managed all the diverse personnel and special expertise involved in the task. When working with numerous consultants and multiple departments, it is important that everyone knows his or her role. DPS management procured the project so that roles of the consultants were clearly and contractually defined. It created a team that used the strengths of each vendor and city department. Network Fleet provided the GPS data from the vehicles to feed the GeoEvent Processor. Esri assisted with the GeoEvent Processor configuration and geoprocessing tools. T&M Associates acted as the project coordinator and developed the web interface as the front end of the application. The city DoT provided general GIS support, as well as server configuration and testing for all phases of the project. DPS managers coordinated through weekly meetings and e-mail updates with the entire project team. It is easy to get management's point of view on how operations should flow, but the real information comes from the staff who is working with the data on a daily basis. The project team worked with the staff to determine both common operating and emergency procedures to create tools and reports that will assist them during a snow event. 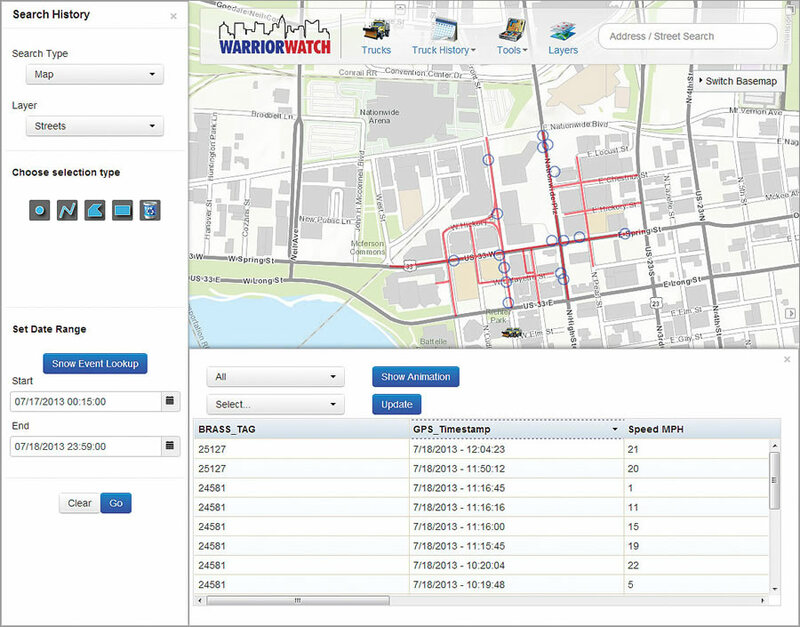 Warrior Watch searches by map to show history of plow data (location, plow up/down, salt spreader) in a specific area. The DPS staff required that the application display the current location of snow operations vehicles and any additional sensor information in 15-second time intervals. This included heading, speed, whether the plow is up or down, and whether the salt spreader is activated. Snow Warriors performed dry runs on actual snow routes to test the GPS and provided real data so that the application was tested and validated. They carefully documented and quantified results so that the project team could modify the application for final delivery. There is no need to add complicated tools or widgets to an application that has a specific goal. A user-friendly and relevant application made it easier to keep the roles defined and the task manageable. The city was wise to keep this application separate from others so that it can be used for snow event operations. However, the project team had the foresight to build this initial system in a modular fashion so it could quickly and efficiently add additional vehicles and custom reports to the application and expand the functionality to meet the changing needs of the Department of Public Services while still controlling all aspects of management. Displaying real-time vehicle location data provided by Network Fleet (15-second intervals). 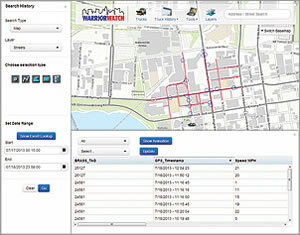 Allowing users to search historical vehicle activity by a location on the map or by information, such as brass tag, street centerline, or street maintenance zone. Providing standard reports for route completion, customer service requests, and truck activity summary. Implementing new technology is always a challenge, but DPS management and operations staff accomplished the task with an efficient and methodical management style. By engaging DoT staff at the beginning of the project and choosing a team of consultants who were able to work constructively together, they created an environment that was both cordial and professionally productive. The City of Columbus can now efficiently coordinate resources during snow events and track information associated with cleanup efforts. Darlene Magold Scott, GISP, is the GIS director for T&M Associates and is located in Columbus, Ohio. She has worked with the City of Columbus DPS and DoT for the past seven years. Erick Lobao, GISP, is a GIS manager for T&M Associates and is the project manager for the Warrior Watch project. He successfully led this project with a talented team of application developers, Jesse Glascock, GISP, and Jon Woyame. City of Columbus DPS project managers Rick Garrabrant, PS; Shane Mark, MS; and Elizabeth Jones led the project and the Snow Warriors using GIS technology. The City of Columbus DoT; Shoreh Elhami, GISP; Brian Nemec, ME, GISP; and Rob Parsons, GISP, assisted with the implementation and management of the new GIS technology. For more information, contact Darlene Magold Scott.